The Alvin Titan Wood Table 36X48X37 is a durable and professional-looking draft table, making an excellent addition to any craftsman's office. Stable and sleek, the Alvin Titan Wood Table is an excellent, professional-looking addition to any functional work space. This four-post drafting table is designed with two coats of varnish on the solid oak base for added durability, while the table top is constructed of 3/4" warp-free white Melamine for a smooth workspace and for protection against daily use. 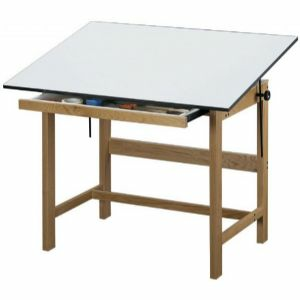 Offered in the optimal drafting height of 37" as well as an office-friendly height of 30" to easily transition from a standard 0° desk space to a 45° drafting table, while the surface top is offered in three sizes: 31" x 42", 36" x 48" or 37 1/2" x 60". The secure legs are constructed with a through-bolt design for long-term stability and offers spacious leg room that accommodates for a desk chair. The 23"d x 31"w x 1 1/2"h front drawer makes it easy to access supplies quickly, while the top-angle adjustment is simplified with a one-handed tilt mechanism. Shipped with an easy assembly instruction manual, this item makes a perfect centerpiece to any drafting environment.